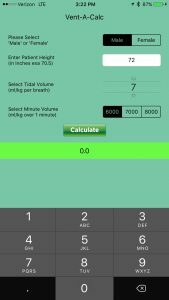 Designed for the EMS professional, this simple to use app can be loaded onto your iPhone®, iPad®, iPod touch®. 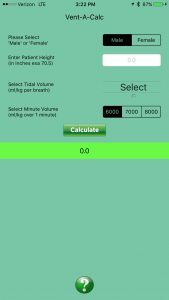 Its designed to calculate the ideal respiratory rate of your patient on a ventilator. This saves time, and precious seconds when they matter the most. 5) Press CALCULATE Thats it! your result is displayed in the green bar below the calculate button. Available NOW!